Services / facilities within the building include a railway, bus and Metrolink station, Cafe Ritazza, WH Smith and access to 4M Offices. 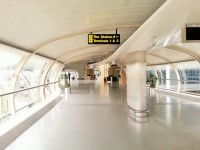 The station can be accessed from all 3 airport terminals and the Radisson BLU via a combination of external covered walkways and internal skylinks. 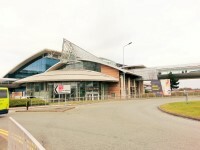 This venue is situated in Manchester. 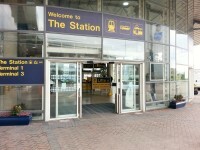 The drop off point is located at the front of the station, by the taxi rank. There is tactile paving on the dropped kerb. 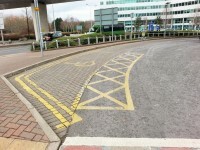 The drop off area includes a marked designated bay. 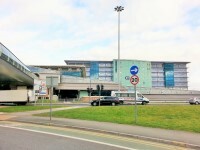 The nearest car parks to the station are the Radisson Hotel and Terminal 1 Arrivals car parks. You are on Route from Terminal 3. Skip to the next section. Follow the directional signs for The Station. 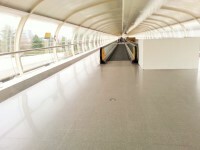 Access is via a covered walkway with moderate slopes to the Terminal 1 Building. 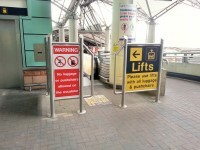 Passengers must then take the car park lift to level 7 and the skylink from there to the station. 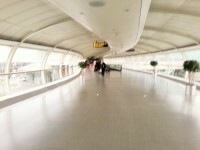 The distance from Terminal 3 Door 4 to the station is 495 metres. 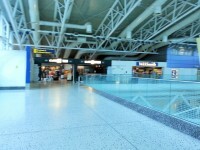 The distance between Terminal 3 Door 4 and the Terminal 1 car park lift is 218 metres. You are on Route from Terminal 1. Skip to the next section. 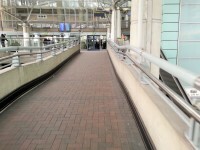 Access to the station from Terminal 1 is via the skylink with moderate slopes on level 7. 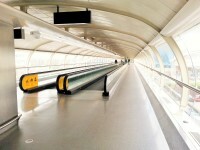 The distance from the Departures car park lifts on level 7 of the Terminal 1 building to the station is 277 metres. 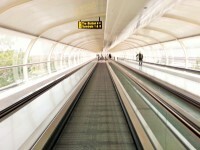 The distance from the Terminal 1 Arrivals lift on the skylink to the station is 192 metres. 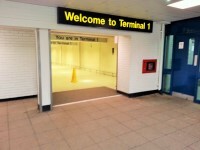 You are on Outside Access (Entrance from Terminals 1 and 3). Skip to the next section. This information is for the entrance located at the side of the station. The door opening is 280cm (9ft 2in) wide. The door opening is 145cm (4ft 9in) wide. 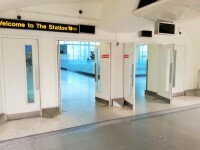 This entrance give access to the upper level of the station. 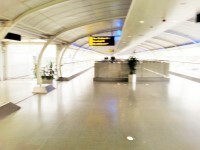 You are on Level Change (Entrance from Terminals 1 and 3). Skip to the next section. 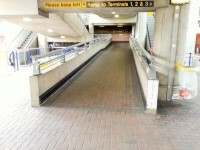 The ramp or slope is located leading to the entrance from the skylink. You are on Route from Terminal 2. Skip to the next section. 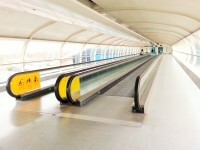 Access to the station from Terminal 2 is via a skylink containing travelators. The distance from the terminal to the station is 407 metres. You are on Route from the Radisson BLU. Skip to the next section. 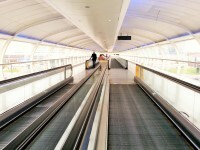 Access to the station from the Radisson BLU is via a skylink, which contains travelators. The distance to the station from the hotel is 121 metres. 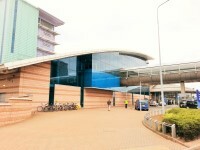 You are on Outside Access (Entrance from Terminal 2 and Radisson BLU). Skip to the next section. The door opening is 157cm (5ft 2in) wide. 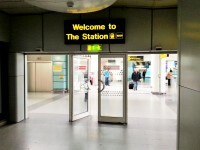 This entrance gives access to the upper level of the station. 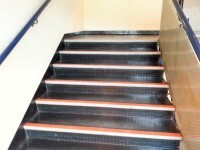 You are on Other Floors (Ground to Upper Level). Skip to the next section. 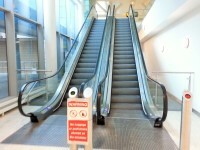 The head and foot of the escalators are clearly marked. 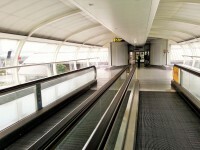 The stairs are located next to the entrance from Terminals 1 and 3. 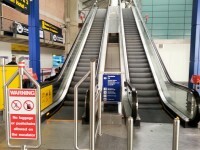 There are escalators located just inside the main entrance, and also by the bus station. 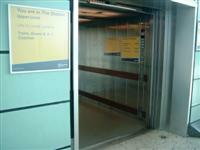 You are on Lift (Lift - Entrance from Terminals 1 and 3 to the Train Station). Skip to the next section. 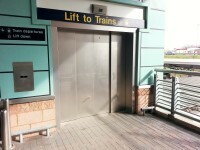 The lift is located just inside the entrance in the Rail Station. 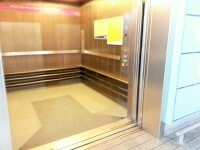 The floors which are accessible by this lift are Ground and Upper Level. 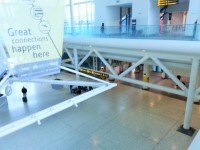 The lift is 14m (15yd 11in) from the entrance from Terminals 1 and 3. The dimensions of the lift are 220cm x 247cm (7ft 3in x 8ft 1in). The clear door width is 177cm (5ft 10in). There are 2 lifts available here. The distance between these lifts and the lifts to buses, coaches and trams is approximately 65 metres. You are on Lift (Lift to Buses, Coaches and Trams). Skip to the next section. 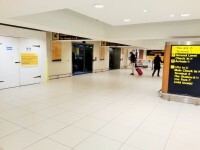 The lift is located opposite the entrance from Terminal 2 & the hotel. 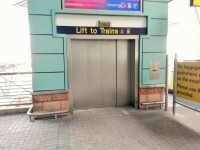 The floors which are accessible by this lift are Metrolink Platform - Ground - Upper Level. 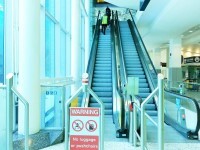 The lift is 37m (40yd 1ft) from the entrance from Terminal 2 and Radisson BLU. The dimensions of the lift are 202cm x 282cm (6ft 8in x 9ft 3in). The clear door width is 180cm (5ft 11in). 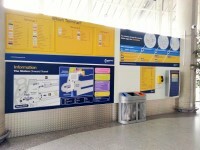 This information is for the entrance located at the front of the station. The door opening is 152cm (4ft 12in) wide. 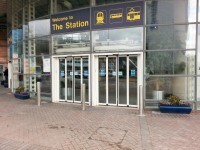 There are several entrances at the front of the station which give access to the ground level. 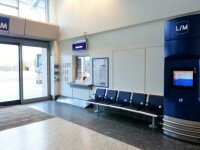 Photograph 1 shows the Onward Travel and Hotel Information Screen, located just inside the main entrance. Photographs 2 and 3 shows part of the upper level of the station. 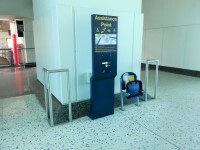 You are on Ground Level Assistance Point and Courtesy Phone. Skip to the next section. 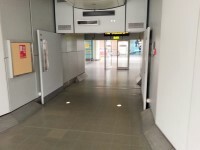 Photograph 1 shows Station Assistance Point 1, located just inside the main entrance which is 10 metres from the main entrance. 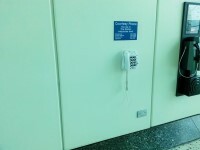 Photograph 2 shows the courtesy phones, located by the lifts next to the entrance from Terminals 1 and 3. They are 34 metres from the main entrance. For more information on assistance that is available, please see the Airport website Accessibility page. You are on Flight Information Display. Skip to the next section. 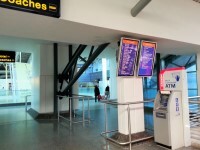 There are Flight Information Display screens available on route between the platforms and station and on the ground and upper levels. 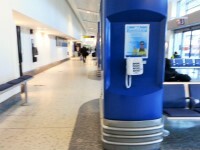 You are on Upper Level Assistance Point and Courtesy Phone. Skip to the next section. 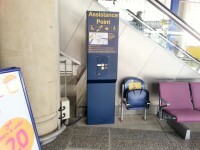 The photographs show Station Assistance Point 3, and the courtesy phone, located on the upper level of the station, opposite Caffe Ritazza and WHSmith. They are 29 and 31 metres respectively from the lift next to the entrance from Terminals 1 and 3. You are on Bus Station Assistance Point and Courtesy Phone. Skip to the next section. 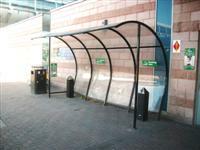 Photograph 1 shows Station Assistance Point 2 in the bus station area. 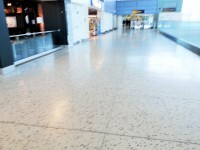 It is 89 metres from the main entrance. 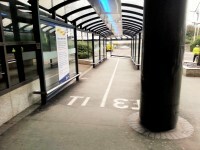 Photograph 2 shows the lowered courtesy phone in the bus station area. 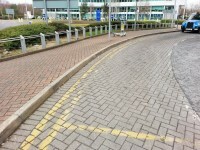 It is 92 metres from the main entrance. There are 3 platform(s) in the station. There are generally 5 member(s) of staff on duty. There is an office to obtain help. 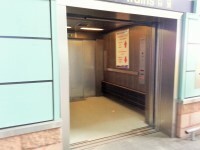 The office to obtain help is 75m (82yd 1in) from the lifts to the platforms. This office is located on platform 3b. The ticket office is located on the station concourse. The ticket office is 25m (27yd 1ft) from the main entrance. 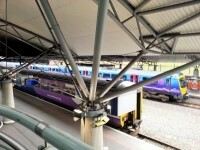 The train companies operating from within this station are First Transpennine Express and Northern Trains. 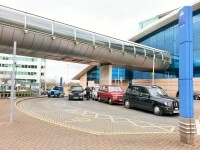 The taxi rank is located outside the main entrance at the front of the station. 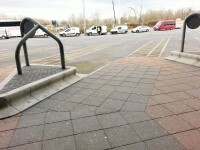 The taxi rank is 24m (26yd 9in) from the main entrance. 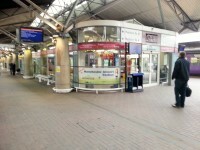 Shops and services within the station include Caffe Ritazza and WHSmith on the upper level, and Refresh in the waiting room between platforms 2 and 3. 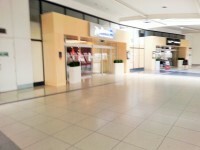 All key concourse shops and services have level access. 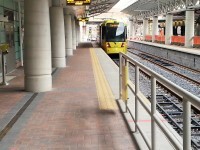 Platforms which have tactile markings at the platform edge are 1-3. Accessible toilets are located on the platform(s). To borrow a wheelchair, please go to the duty managers office. You are on Reception (Train Ticket Office). Skip to the next section. The desk is 25m (27yd 1ft) from the main entrance. 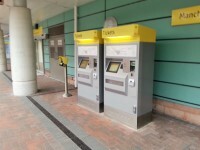 The ticket office is located on the ground level of the station, opposite the entrance to the platforms. 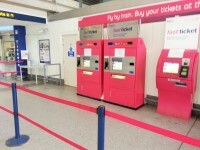 There are also ticket machines available on the ground level concourse, to the side of the ticket office. The ticket office is open 24 hours a day. You are on Doors to the Train Platforms Area. Skip to the next section. The door opening is 127cm (4ft 2in) wide. The doors are 30 metres from the main entrance. 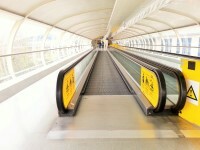 You are on Other Floors (Escalators to the Train Platforms). Skip to the next section. You are on Level Change (Ramp to the Train Platforms). Skip to the next section. 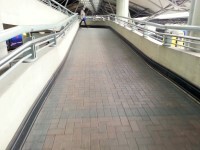 The ramp or slope is located just past the doors to the train platforms area. 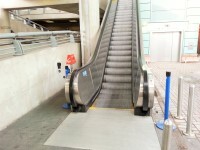 This ramp can be overcome by using the lift to the train platforms. You are on Lift (Lifts to the Train Platforms). Skip to the next section. 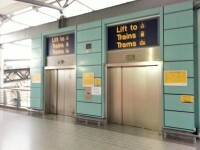 The lift is located either side of the ramp to the platforms. The lift is 43m (47yd 1in) from the main entrance. The dimensions of the lift are 224cm x 253cm (7ft 4in x 8ft 4in). The clear door width is 181cm (5ft 11in). You are on Train Station Platform. Skip to the next section. This information is for platform(s) 1-3. 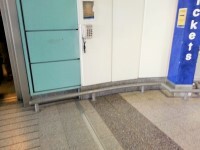 The platform(s) which can be accessed by either level access / ramps / lifts / stairclimber from inside the station is / are 1-3. 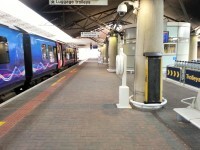 Accessible toilets are 18m (19yd 2ft) from the lifts to the train platforms. You are on Accessible Toilet (Train Platform). Skip to the next section. 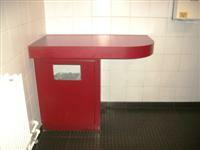 This accessible toilet is approximately 18m (19yd 2ft) from the lift to the train platforms. 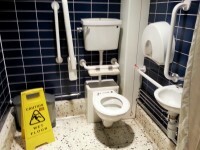 This accessible toilet is located behind the lift at the end of platform 2. The dimensions of the accessible toilet are 176cm x 234cm (5ft 9in x 7ft 8in). The lateral transfer space is 137cm (4ft 6in). 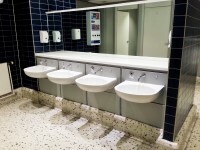 The height of the wash basin is 77cm (2ft 6in). There is a RoomMate device available for the accessible toilet. RoomMate is an electronic, wall-mounted device which offers audio description of the toilet to blind and visually impaired visitors. For use of the RoomMate please phone the venue in advance. You are on Standard Toilet(s) (Train Platforms). Skip to the next section. The female and male toilets are located behind the lifts at the ends of platforms 3 and 2. The female and male toilets are 11m (12yd 1in) from the lifts to the train platforms. Baby change facilities are located just past the female toilet. 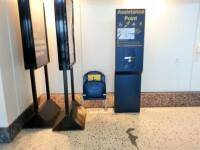 The baby change room requires a RADAR key to access, which can be obtained from the Duty Manager's office or a member of the platform staff. You are on Bus Station. Skip to the next section. There are 11 stands / bays. There is an office to obtain help (other than the ticket office). The office to obtain help (other than the ticket office) is located at the far end of the station, by the entrance to stands L-N. The help office is 132m (144yd 1ft) from the main entrance. 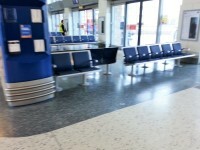 There is a ticket office / travel centre. 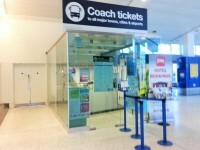 The ticket office / travel centre is located at the front of the bus station area. 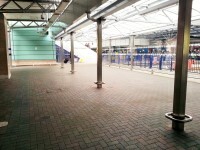 The ticket office / travel centre is 66m (72yd 6in) from the main entrance. 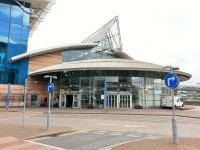 The bus companies operating within this station are National Express, Arriva, Stagecoach, MCT Travel. 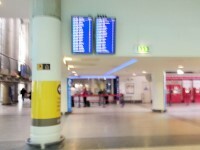 You are on Reception (Bus Station Travel Centre). Skip to the next section. 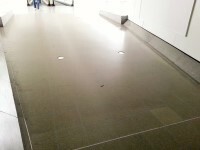 The desk is 66m (72yd 6in) from the main entrance. 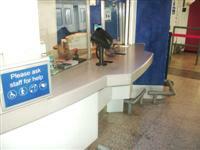 A new desk with a lowered section is due to be fitted in the Travel Centre. You are on Bus Station Stand. Skip to the next section. Stand / Bay number(s) A-N. 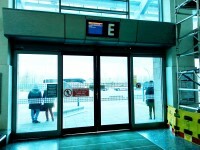 The stands which have level access are A-N.
All stands are accessed by double automatic doors, 200cm wide. You are on Accessible Toilet (Bus Station). Skip to the next section. 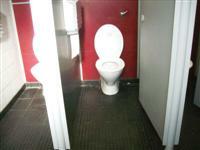 This accessible toilet is approximately 112m (122yd 1ft) from the main entrance. 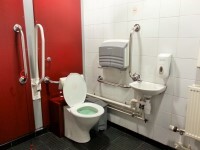 This accessible toilet is located along the side of the bus station area. 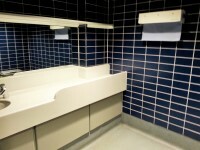 The dimensions of the accessible toilet are 127cm x 190cm (4ft 2in x 6ft 3in). You are on Standard Toilet(s) (Bus Station). Skip to the next section. The female and male toilets are located on the side of the bus station area. The female and male toilets are 106m (115yd 2ft) from the main entrance. Baby change facilities are located between the adapted toilets. 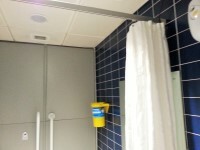 The toilets contain a larger cubicle, with grab rails fitted. 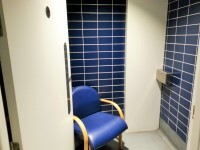 The baby change area also contains a separate room for breast feeding. You are on Other Floors (Merokink platform). Skip to the next section. 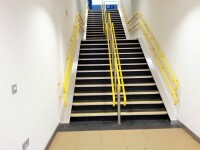 The floors which are accessible by stairs are Metrolink Platform - Ground. 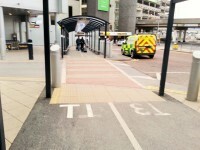 The stairs are located off the Bus Station area, opposite stand E.
The escalators are by the lift to buses, coaches and trams. You are on Metrolink Platform. Skip to the next section. 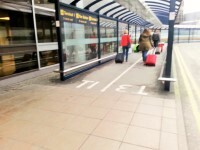 There is a strip of tactile paving along the edge of the tram platform. 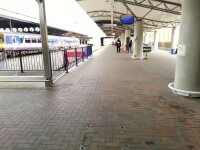 The surface of the platform is brick block paving. 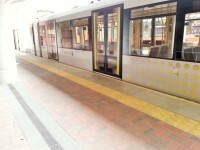 There is level access onto the trams from the platform. 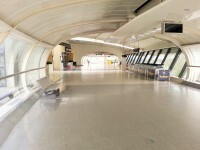 The platform contains ticket machines, seating and passenger help point with a hearing loop. The main part of the platform is 30m from the lift to buses, coaches and trams. Assisted Rail Travel: 0845 600 1674. 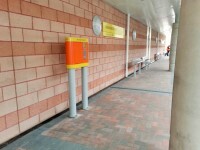 The photograph shows the smoking area, located just outside the main entrance.